Just upstream from the Dam No. 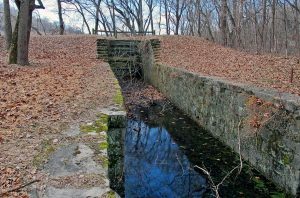 3 site, you’ll find the remains of the guard lock for the dam. Made of gray limestone, this inlet lock also acted as a lift lock because it was located at a lower level than the river. The towpath crosses over the lock, which has been partially filled in. You can find the brick shell of the old lockhouse nearby.